This pair of palm trees on the beach caught my eye. 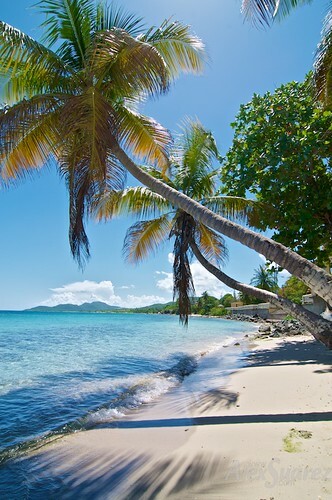 You could lay in the surf and be shaded by a palm tree at the same time. How cool is that? This is in the town of Esperanza on the Caribbean Sea on the island of Vieques, immediately East of Puerto Rico. Amazing turquoise and aqua colors in the water. What are some of your favorite vacation spots? This coconut was washed up on shore. It looked like it had spent some time adrift before washing back ashore. Austin folks: Tomorrow, John Langford will be speaking about his Box Humana project at the CapMac Advanced Photography SIG. More details here. Under the shade of a Flamboyan tree, I stopped to take in the scenery of the crystal clear waters from El Malecón, a mini boardwalk. On this side to the street is a wide sidewalk with incredible views of the Caribbean Sea. On the opposite side is a row restaurants, bars and a museum. One of life’s small pleasures. A boy draws in the sand with a stick. Notice the hoof prints in the sand in front of the boy. Those are from paso fino horses that roam freely over the island. As we approached the island of Vieques in a twin-engine Cessna, I noticed an isolated rain shower off to my left. The island is just coming into view on the right. Total flight time from San Juan to Vieques was 23 minutes. Moments after I took this shot, we descended, banked 90° left and landed at the airport by the shore.